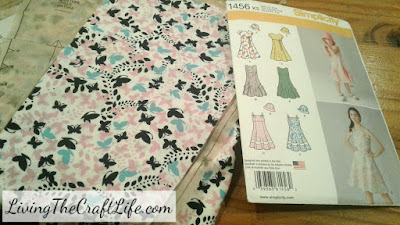 A few weeks ago I was getting some fabric at Joann's Fabric and Craft Store. They were having an amazing deal on quilting cotton fabrics and since I promised my daughter we would start quilting together, we went to go look at some fabrics. As we were perusing through the aisles and different swatches of fabric, she found one that really caught her eye. "Mom, I love this fabric. It would make a beautiful dress!" Well, I had to get it for her! If she wanted to make a dress instead of a quilt, who am I to complain? It has been a while since I made a dress for my girls, so I figured we could put this one together. We went to the pattern section to pick out a pattern. I knew that at home we only had patterns in smaller sizes, and she is about to turn 9. We flipped through the books and found out that Simplicity patterns were on sale for $.99! What great timing!! We had picked out a couple but only one was in stock in the size we needed. So we picked that up, had our fabric cut, and went home! First I cut out all of the pattern pieces and laid it out on the fabric. I had my daughter help trace the correct size onto the fabric, and she did most of the cutting. I showed her how we follow the directions, starting with the stay stitching. We stitched all those pieces and started putting together the bodice. She kept getting SO excited as each piece was added and created a more finished look. I showed her how to iron everything flat. Then, I put the sleeves on. Sleeves are one of those beasts that you just don't tackle at 8 years old. I had her watch me so she could see HOW it was done. We started putting together the dress. I lined up the pieces and pinned them and she sewed them all together. She attached the dress to the bodice, but I had to do it one more time because her line was a little zig-zaggy. This line HAD to be straight. We ironed the hem and I showed her how to do the first few feet. How you should hold your hands and help keep the fabric flat, how you should keep the stitches close to the edge so that it has a nice finished look. I was thoroughly impressed at how well she did this hem! After that, all we had left was the zipper. 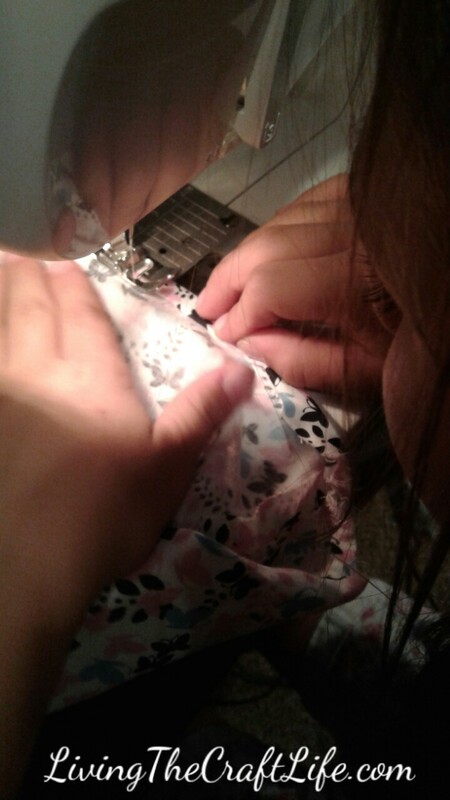 I explained to her how that was done, and I sewed it in. After so much sewing experience, zippers don't scare me at all. I can even do it without the zipper foot and without pre-sewing the seam. I'm all about efficiency and speed!! And this is how it all turned out! She was jumping and so excited to see how beautiful it turned out. My daughter turns 9 this week and with how well this project went, I think we will be turning out more projects together! Do you enjoy crafting with your kids? Post a comment with a link to your projects! Aww! that turned out really well!! Both of you make a really good mother and daughter pair!! Keep it up guys !! And of course don't forget to have fun!! !